Xump Dreamcast 1.0 now available! Xump is, for those who do not know it, a fun game where you have to solve 48 levels by cleaning the boxes with our protagonist Xump (hence the name of the game . Made RetroGuru team, and as with the Giana SQRXZ or series, is also multiplatform in many systems. And after 2 weeks present at the fair Retrobörse Rosenheim, Germany, I have to download ABSOLUTELY FREE to our dreamcasts! Some of you are getting impatient waiting for GDEMU payment request to arrive. Sorry about that – the plan was to do it faster this time around but the recent heat wave has put a stop to it. I have quite a few units assembled in 70% but that’s it. Finishing that, plus cleaning, plus initial program upload, plus testing – that takes time too. You’ll have to wait some more I’m afraid. About the payment itself, it’s not 100% safe so to speak. I send the payment request from different mail address than the one you used for preordering. In itself it’s nothing strange but it raises the question – how do you know the request actually came from me and not someone else who is about to scam you out of your money. Well, if you have any doubts about that feel free to contact me first to confirm. Also, do not send money to the preorder address. That email is not registered with PayPal – not only will I not claim that transfer, I have no way of promptly rejecting it either. That means it will be stuck for 30 days in PP system (and returned automatically to you after that time) as well as possibly prevent you from paying when I actually send the request – as you might not have another 100 Euro for that. Remember, I do not take any money up front, only when I actually have the GDEMU unit ready will I send the request. The lower you are on the list the longer that will take. Lastly, I’ve decided to stop sending the paper inserts warning about possible dangers of installing the screw improperly. All this is explained on the Installation page, you are required to read all of that (and everything else I’ve prepared). In other words, if you manage to damage your Dreamcast or GDEMU because you couldn’t be bothered to read the instructions, I will laugh at you and call you stupid. So that we are clear on that. I’m happy to report that while there have been some minor accidents and issues with GDEMU, so far nothing that would actually break the device and/or console permanently. Please do try to keep it this way from now on as well. GearSystem Git (2014/07/25) is complied. GearSystem is a Sega Master System / Game Gear emulator written in C++ that runs on iOS, Raspberry Pi, Mac, Windows and Linux. The main focus of this emulator is readability of source code with very high compatibility. Reicast Git (2014/07/25) is compiled. reicast is a multi-platform Dreamcast emulator. The project is currently in Alpha, usability, performance and stability issues are to be expected. Cortex-A9 dualcore, 1ghz+ is the minimum hardware for decent speeds. DGen v1.33 is compiled. DGen/SDL is a free, open source emulator for Sega Genesis/Mega Drive systems. DGen isn't the best Mega Drive/Genesis emulator out there, but it works and it's probably the most portable. It's also perfect for command‐line freaks. * Joystick hat is now handled correctly. * Added bindings to switch between previous/next save slots. * Fixed joystick calibration issues. * Fixed ROM corruption when using Musashi. ROM was not actually read-only. * Fixed support for overlapping save RAM and ROM areas. working correctly. Can still be done manually. * Debugger: fixed Z80 endianness issue when displaying registers. prefetched PC data when reading these addresses. * Implemented word (16 bit) memory callbacks for CZ80 to improve performance. * Debugger: integrated dZ80, a Z80 disassembler. * Fixed interrupt mode 0 in CZ80, fixes sound issues in a few games. cores (MZ80, CZ80 and DrZ80). accordingly to solve dump/restore issues. by the same amount in both directions. (scale2x, hqx) now use a similar API. Makes things a lot simpler. as its predecessor. Useful when OpenGL cannot be used. never modified by DGen/SDL (except during init). * Disabled save/restore when no ROM is loaded. * Added config_save and config_load commands. * Calibration screen is not a CTV filter anymore and is always available. * Added preliminary support for Sega Pico. * Added VGM dumping functionality (vgmdump command). Theme ROM). The default sound rate is now 44100Hz instead of 22050Hz. * Added missing YM2612 and DAC information to save states. * Fixed pbm2df issues on Windows by open files in text mode. * Fixed bind_* commands to run only once. quitting DGen/SDL) is now supported. See documentation. * Merged stopped and main events loops to remove some redundancy. * Added standard bindings for Pico pen. other controller (also added mou_* variables similar to joy_* and key_*). is screen blinking due to double buffering, now disabled by default. during SDL_SetVideoMode() are also worked around. Keep Dreaming is a series of videos by Adam Koralik dedicated to various aspects of Dreamcast gaming and collecting. This one sees the addition of a new team member. We welcome dink to the team who has done a lot of excellent work on save state and general bug fixes. He has also improved iq_132s old Kaneko Super Nova driver which is now enabled in release builds with more games supported. He has also added vbt´s Choplifer driver to the Sega System 1 driver. Fanwor is an adventure game in the style of the game "The Legend of Zelda" (Copyright Nintendo). It was originally designed for programming contest "Magic Game Contest" held in 1999 for the old Atari TOS computers. He did very well because it was third! : D Years later, he decided to adapt the code for Unix environments and using the SDL for the graphics engine. Fanwor Zelda is a "simplified": a sword, no bosses, dungeons without secondary quests, no money ... The objective is to recover stolen gems 8 ... and cool! With the D-PAD you move your character and attacks with any button. Good luck! Via our friends at Dreamcast-News, we present a new homebrew game that is being developed for Dreamcast: Sydney Hunter and the Caverns of Death Its author, Michel Louvet, is so nice that it has even made ​​a video that explains various concepts programming (in French, but worth it!). Yabause SVN r3250 is compiled. Yabause is a Sega Saturn Emulator(SS Emulator) for Linux, Windows and Mac OS X.Yabause support booting games using Saturn cds or iso files. GearSystem Git (2014/07/18) is complied. GearSystem is a Sega Master System / Game Gear emulator written in C++ that runs on iOS, Raspberry Pi, Mac, Windows and Linux. The main focus of this emulator is readability of source code with very high compatibility. Reicast Git (2014/07/18) is compiled. reicast is a multi-platform Dreamcast emulator. The project is currently in Alpha, usability, performance and stability issues are to be expected. Cortex-A9 dualcore, 1ghz+ is the minimum hardware for decent speeds. Metallic posted new screenshots of Airline Pilots Deluxe (Sega Naomi Multiboard) and Sega Strike Fighter Deluxe (Sega Naomi Multiboard) emulation in Demul with multi display support. Just FYI after I’m done with this run there will be a small break. Don’t expect 3rd run to start right away, if at all. I want to focus a bit on other stuff, like PCE for example. To that end I’ve already purchased DE1-SoC kit from Terasic/Altera. Original DE1 was quite popular due to both low price and pretty neat features like lots of I/O pins, SDRAM / SRAM / FLASH chips, VGA output and audio codec. People’ve managed to emulate Amiga 500 on that, as well as PC-XT class system (CPU and the peripherials) good enough to run Dune 2. But, DE1 was based on Cyclone II, something that Altera dropped support for about a year ago. So, basically GDEMU is based on (as of now) outdated FPGA. DE1-SoC looks a lot like DE1 and also has a great price for what it is – the main reasons for the name not being DE6 I suppose. But the big difference is the “System on Chip” part, it’s not just a bigger and better FPGA from the current 28nm based Cyclone V family, it has two physical Cortex A9 cores integrated into it. Each core runs at 800MHz and is a bit more than twice faster compared to Raspberry Pi CPU overcloced to 900MHz. CPUs are connected to FPGA fabric with 2 high-speed busses and one slower, simpler 32-bit bus, which is easier to use in smaller projects. There are a few Linux based images provided with the board, and the SoC can boot either the CPU first from microSD memory card or the FPGA first from the on-board configuration chip. I’ve already put this new toy to good use – its considerably bigger internal SRAM allows for bigger logic analyzer buffer. I could probably already make a prototype PCE drive replacement that would be good enough to run a few games. And that’s exactly what I want to try next. The set-top box market is currently flooded with many cheap Android boxes, but they tend to offer limited remote access plus expansion capability, so it's about time that something more exciting popped up. One such candidate is the EzeeCube, which aims to be an idiot-proof media hub with three main selling points: Auto-sync content across multiple platforms (Android, iOS, Windows and OS X); simple initial setup for accessing hub content from anywhere; and cable-free expansion that lets you stack up to four modules. 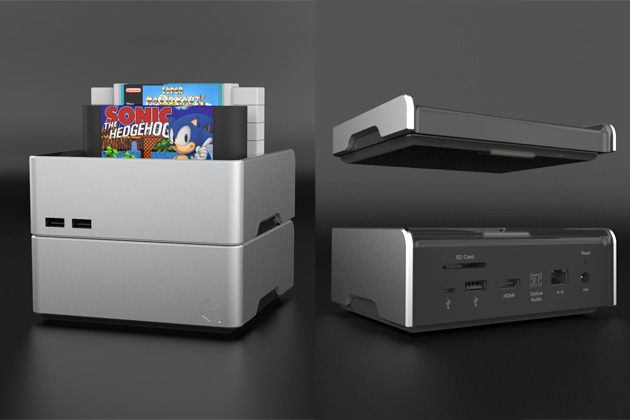 We're talking about slapping on an extra hard drive, a Blu-ray drive, a TV tuner and even a retro gaming module that will bring your dusty SNES and SegaMega Drive / Genesis cartridges back to life. No messy cables here. GearSystem Git (2014/06/25) is complied. GearSystem is a Sega Master System / Game Gear emulator written in C++ that runs on iOS, Raspberry Pi, Mac, Windows and Linux. The main focus of this emulator is readability of source code with very high compatibility. Reicast Git (2014/06/28) is compiled. reicast is a multi-platform Dreamcast emulator. The project is currently in Alpha, usability, performance and stability issues are to be expected. Cortex-A9 dualcore, 1ghz+ is the minimum hardware for decent speeds. Yabause SVN r3246 is compiled. Yabause is a Sega Saturn Emulator(SS Emulator) for Linux, Windows and Mac OS X.Yabause support booting games using Saturn cds or iso files. Reworked QT's cartridge settings so file field is disabled for some cartridge types and a load dialog is used for ones that make sense.